Perhaps you’re fully immersed in the Google ecosystem or have recently switched to an Android device as the iPhone X or iPhone 8 didn’t quite tick your boxes but miss the iOS experience. Now you can get the best of both worlds leveraging the flexibility of Android and make your device at least look like it runs iOS to make you feel more at home by using an iPhone launcher for Android. The beauty of Android is that the system launcher – the screen you see when you press the home button on your device – can be customized or completely replaced. Many will stick with the stock launcher that ships with the device, whether that be the Pixel launcher or Samsung experience with a Galaxy device. Others may choose to replace it with something like Nova launcher that offers a ton of custom options. You may, however, prefer to replace it with a launcher that ultimately detracts from the Android experience and that’s where this iPhone launcher for Android comes in. Aptly named, this iPhone launcher for Android not only replaces your stock launcher to offer a stock look, but it also adds some features found in iOS directly to Android to make it feel like you’re using an iPhone X. The best launcher for Android to replicate iOS – There are a ton of launchers on the Google Play Store that claim to replicate the iOS experience, however, this particular one is one of the best even able to reproduce the fluid style of the iPhone X including the wallpaper & icon sets. Swipe Up Control Center – One of the prominent features that define iOS is the Control Center. Just swipe up on the desktop to open the iOS 11 looking control center, where you can quickly control the phone WiFi, Bluetooth, signal, flashlight, volume, brightness, screen rotation, etc. Swipe down to open all apps – You’ll be able to replicate the gestures found in iOS and can even hide the icons of all apps to make the desktop closer to the iOS launcher style. To view your apps, you can swipe down to open it. Phone X theme style Weather and Time widgets – Swipe to the left on the desktop to open the Weather and time widget for an instant view of the weather that day. Lock Screen – Unique lock screen and password unlock interface; the launcher even includes a replacement lock screen theme for Phone X with iOS 11 wallpapers to bring the experience even closer to that of the Apple iPhone X. 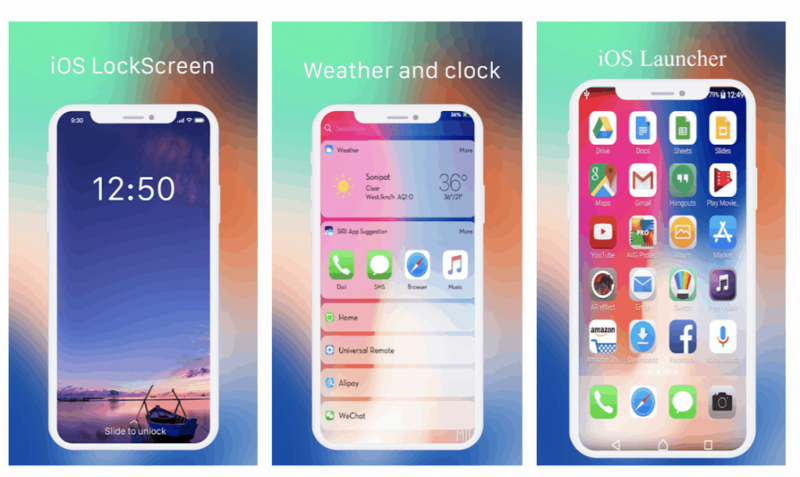 Latest wallpaper and icon sets – The launcher also includes rich icons that are found in the iPhone X theme library to make the apps look on Android how they do on iOS. Also, there are also the latest wallpapers give you a comparable experience to that of iOS. 3D Animation Effects – To provide the launcher with a more dynamic feel, there are also 3D effects. Powered by a 3D animation engine with graphics effects, you’ll get 3D themes and widgets. The launcher will automatically enable 3D transitions, and you’ll be enjoying 3D effects in no time. Live wallpaper – Live wallpapers customize the traditional flat default menu interface to make your launcher more stylish. Smart Search – Provides quick access and quick search to useful applications and control panel direct from the home screen. Notification Lock screen & Notification Center – Just like iOS 11, you’ll get display notification information on the lock screen akin to an iOS experience. Notification bar iPhone X plus – Simply swipe down to display the notification bar just like on the iPhone. Easy to use Phone Launcher iOS 11– Deleting apps and moving apps around has never been easier with this launcher. Simple and flat design – The launcher is designed to consume less memory and power to bring a faster experience for this iPhone launcher for Android. The app is free from the Google Play Store and will instantly make iOS users feel at home on Android. If you would like to download the launcher, you can do so by visiting this link from the Google Play Store. Leave us a comment below and let us know what you think of this iPhone launcher for Android and if you’ve come across any alternative launchers that you like.